This is last night's "long pose" - which is about 2 hours as there is set-up time, always a bit of an adjustment to make with lighting, and then breaks for the model, then clean-up time- so a three-hour period is not three hours of drawing. The evening gown was a sort of iridescent silver grey with a lovely shimmer. However, when I applied grey pastel, it looked greenish. I think that was because of the red paper. The grey took the complementary colour. I had to combat that by using some lavender pastel first and also using pure black and white as well as greys. Still, it was interesting working on the red paper as it made the set-up more dramatic and gave a good underlying warmth to the skin. I might consider making a painting of this and I do have a reference photo as well- but the skin tones and light on the dress show so much better in the pastel! A lot of pencil companies are named after people -such as Faber-Castell, Dixon and Conte'- while others may take place names like Cumberland, but one manufacturer has a different name altogether- Koh-i-noor. I've used the pencils - even have a lovely big set of coloured pencils, but I didn't think too much about the name until I got into this whole research on pencil names (see previous posts). Koh-i-noor is the name, from Persian for "Mountain of Light" of the famous large colourless diamond that is now part of the British Crown Jewels. The pencil company was founded in Vienna around 1790 by Joseph Hardtmudth. Variations in spelling of his last name appear on pencils today. In 1848, he relocated to Ceske-Budejoivice in the Czech Republic where the company remains a private company to this day. The diamond's story began back in the 13th century when it was found in India and after changing hands many times, ended in the possession of Queen Victoria after the British conquered the Punjab region in 1849. Following a fairly perilous sea voyage, the diamond arrived in London and became the "got-to-see" item in the Great Exhibition at Hyde Park, London in 1851. Jostling crowds complained that it didn't really sparkle as sunlight was not really catching it. Prince Albert was also unhappy with the dull irregular gem and in 1852 had it cut down from 186 carats to 105.6 carats. Some size loss was because of the discovery of flaws, but after 38 days of cutting, the diamond emerged 42 percent lighter in a dazzling, oval-cut brilliant. It was worn in a brooch by Queen Victoria. After her death, it was set into a crown for Queen Alexandra and is now in the Queen Mother's crown on display with the other Crown Jewels. There is still some dispute about the real ownership but Britain claims legal ownership under the Treaty of Lahore. Obviously the diamond would have received a lot of attention around the time of the Exhibition and the re-cutting so it must have been around this time that the Czech pencil company adopted the name. Interestingly, Koh-i-noor was the first pencil company to paint their pencils yellow- a colour now quite common for pencils. The photos above are of an art supply store in Cesky Krumlov in the Czech republic. The doors of most shops are double-doors for security. Then,when the outer doors are opened for business, wonderful decorations are often shown. This art store features interesting sculptures that combine fingers and paint-tubes. And, yes, they also sold Koh-i-noor pencils. I couldn't resist that title as this is a Life Drawing- 20 minutes - done on Terra-skin, the "paper" that isn't really paper. It is actually ground stone mixed with some kind of a resin. It is a very smooth surface and not as absorbent as regular paper. I did the drawing of the model, Virginia, with "Ink Black" Derwent Inktense pencil, using it dry. Then I used a water-holding brush to wet the lines and produce the wash. Then I added the more intense shadow as the surface was still somewhat damp. This is the first time I have used this paper for life drawing and I thought the Inktense pencil worked well in the limited time frame--- so now I am anxious to try it again. I bought some Terra-skin some time ago but hadn't used it much- but then I thought it could work well with the Inktense pencil because you don't lose any of the intensity of it sinking into paper. The surface is very durable and apparently it is possible to scratch onto the drawing or painting medium but not disturb the surface of the the "paper" itself. It is always interesting to try the challenge of different materials and I can certainly see the value in further explorations of this method- and possibly others on this surface. This is the latest life drawing. 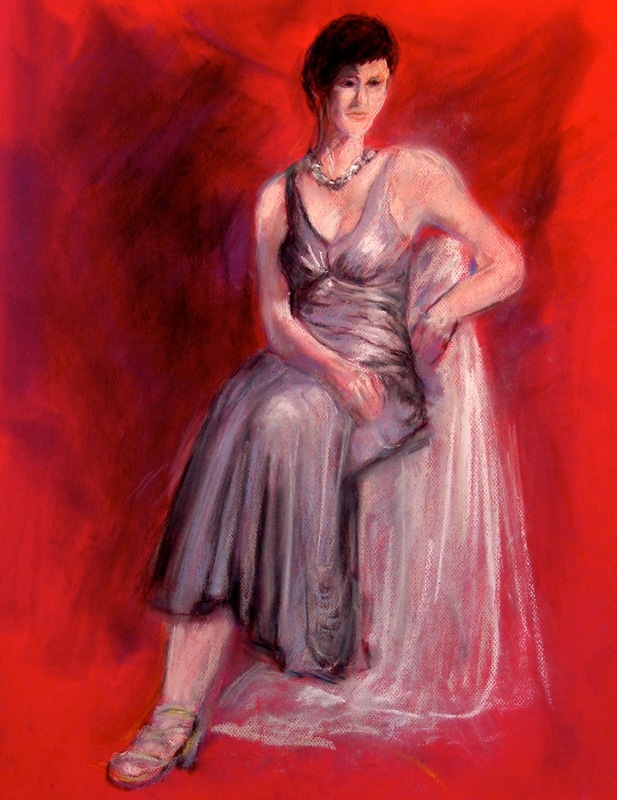 I just put it on my Pinterest board of life drawings. We had Amanda on Friday and I decided to work my mixed-media approach again. 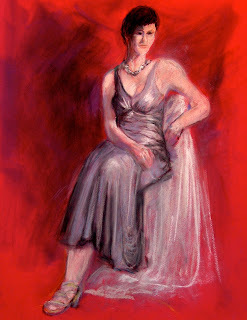 I did the initial drawing with black conte' crayon on watercolour paper and then did a wash of thinned acrylic quinacrodine red, used a blow dryer to dry it and then applied acrylic ground for pastels. Blow-dryer again and then it had a nice gritty surface for pastels, so I finished it in soft pastels. It is a bit looser way of working than working directly in the pastels on pastel paper and I think it gives it more body. I'd rather work on paper than try to paint on canvas in the same time period, which was basically 2 hours. Also- easier to store - but it could be framed as a finished piece. I was in the Richmond Hospital the other day and managed to get a photo of the three-panel painting I did for the Hospital Foundation. It is hanging in the waiting area for Diagnostic Imaging - so take a look when you are passing by. The "dots" are to make it more magical. There are lots of silly things to make it fun to look at and to take people's minds off any stress they may be experiencing. I was talking to a couple of hospital employees and they had picked up on some of the fun things - the cats shopping for fish in Steveston and all those bunny ears in the shrubbery at Minoru, for example. Another bit of pencil history... the Eagle company was founded in 1856 in New York by the Berolzheimer family. In 1969, it became part of the Berol Corporation. Eagle made pencils especially for Thomas Edison - three inches long and with a softer graphite than normal. "Berol" is another name very familiar to artists. It is interesting to find people and stories behind the names we see printed on our pencils and other artist's tools. Following on the idea of Derwent's coloured pencils of 1938, P.G. Hooley invented Powdered Color in 1952 and then sold to Eagle. We know these great coloured pencils as Prismacolor now. In 1989, Berol also bought Osmiroid International, started by James Perry in 1824. Osmiroid drawing pens are another popular artist's tool. Prismacolor has a really interesting website with samples of artist's works and hints for using coloured pencils. The easy spread of information is a great boon for artists today. Studio work continues as various events are around the corner - Richmond Artists Guild show will open in the upper lobby of Gateway on April 1st and run until June 1st, the Finn Slough Show is from April 7th to 10th in the Performance Hall, Richmond Art Centre, and a four-woman painting show, "Four by Four", will be showing at Rocanini Coffee Shop in Steveston from April 18th to June 1st. I have work in all of these - as well as two paintings currently over in Taiwan on exhibit in the National Taiwan Art Education Center. Then there is DoorsOpen June 4th and 5th- so much activity in the art world. The Seated Figure above, turns her back on the whole subject. She has been signed, sold and gone on to a good home. I've just done the March newsletter and used a part of this as the illustration. It is on watercolour paper and was drawn with a sharpened wax crayon and then a watercolour wash was added. I've just taken it down to be framed as I was also taking in the painting that will be in Gateway Theatre upper lobby next month. I had a couple of frames with glass given to me but these still needed matting and proper backing. I'll have them for DoorsOpen - which will be on June 4th and 5th this year. More on pencils: I remember when indelible pencils were fairly common- but I don't remember why- maybe it was before ballpoints, which became common in the mid 20th century. I have a vague memory of my grandparents having indelible pencils . Indelible pencils cannot be erased and were developed in the 1800's as alternatives to fountain pens which were quite expensive then. They could be used on documents and various legal papers. During the war, they were often used to censor letters sent home by soldiers. The earliest indelible pencils had silver nitrate in them. I remember as a small child being warned off them as whatever was used was considered toxic. They are usually made now with graphite and an added dye. There are still artists who like them because they don't smudge - but that would also mean no chance to erase. However, the wax crayon I used in the above drawing was not erasable either. Indelible pencils are also used by dental laboratories- and, in Italy, they are mandated by law for voting papers. No chance of switched ballots!